Here are some things you should do after converting your QuickBooks Desktop file to QuickBooks Online to ensure a smooth migration. We highly suggest you keep your data file in QuickBooks Desktop and maintain your transactions on both sets of books until you determine QuickBooks Online is right for your business. To make sure data was transferred successfully, compare the Profit and Loss and Balance Sheet standard reports in QuickBooks Online and Desktop. Check the AR and Undeposited Funds account balances individually when comparing the reports. Learn what doesn’t come over from QuickBooks Desktop to Online. The date is set to "All Dates" in both products. Your accounting method is set to accrual. Cash basis - Reports may not necessarily match using this accounting method. This is because QuickBooks Desktop and Online don't consider transactions as paid the same way. Stock recalculation - Your reports may not match up if you imported your stock information due to FIFO recalculations that may have taken place. There will be a task on your homepage that has a form which will need to be filed with the IRS stating the Stock Accounting changes that took place. Multi-currency - Transactions with 3 different types of currencies involved do not convert to QuickBooks Online at this time. Is account detail type the same as sub-accounts? After conversion, QuickBooks Online keeps your sub-account hierarchy. However, it also uses an additional level of account typing called "Detail Type." Detail types allow you to be more specific with your account organisation. For example, expense accounts can have a number of detail types, such as Advertising, Supplies and Materials, Legal Fees, and so on. The conversion process assigns detail types to accounts where the detail is obvious (e.g. Undeposited Funds). For accounts where it isn’t clear what the detail type should be (majority of accounts are like this), the conversion process assigns a generic detail type, such as Other Miscellaneous Income. You can correct this later. Run the Account Listing Report to review and edit your accounts’ detail types. Search for and open the "Account List" report. To edit an account's detail type, select the account name. From the Detail Type drop-down, choose the correct detail type. Transactions and payroll accounts are converted to balance your books, but details behind the transactions (like payroll item breakdowns and employee year-to-date numbers) don't convert. In the "Paid in [Year]" column, be sure each employee who received a payroll payment this year is switched to Yes. Note: Employees who haven't been paid in the current year will automatically be listed as No. To enter and/or verify your year-to-date payroll totals and employee info, select Complete payroll setup. To complete the setup, follow the onscreen instructions. Use "Run Payroll" once you're ready to pay your employees. If you were using E-services to pay/file your taxes electronically, you'll need to re-enroll for this service in QuickBooks Online. Just log in, then, go to Gear icon > Payroll Settings. If you were using or want to use Direct Deposit for your employees, you'll need to add your employer and employee's individual bank account info. This can be done from the "Payroll Settings" page, or from the "Employee Setup" screen. Finally, you'll need to enter/reconcile any historical tax payments you made so far this year. Select Employees from the left menu, then Payroll Tax. From here, select Enter prior tax history and begin to add all of the past tax payments that you made for various agencies so far this year. They should balance out against your liabilities (excluding any current unpaid tax liabilities) so far this year. When supported, your payroll history (the setup screen) will come over. You'll only need to verify the totals. If your payroll history does not convert, we'll guide you on how to enter these year-to-date totals to get going again. If you reported "Group Term Life Insurance" or "S-Corp Owners Health Insurance," our system will recalculate net pay per the calculations for QuickBooks Online Payroll. Keep this in mind when comparing your QuickBooks Online Payroll Summary reports to your QuickBooks Desktop Summary reports. Note: Employees who have not been paid in the current year will automatically be listed as No. Follow the onscreen instructions to complete your setup. Use "Run Payroll" when you're ready to pay your employees. If you want to continue using your standalone Payroll, cancel your QuickBooks Online Payroll first. Select the Gear icon at the top, then choose Account and Settings (or Company Settings). In the "Payroll" section, select Cancel. Note: If you have the option to cancel QuickBooks Online but not payroll, please contact us. The update might need to be done on our end to make sure your existing discounts won't be affected. To begin syncing transactions with QuickBooks Online, change your export preferences in Intuit Online Payroll. If your pay types from QuickBooks Desktop were not mapped with a standard QuickBooks Online pay type, then you may be asked to match your payroll items. 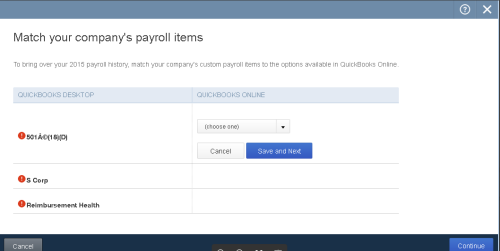 Select the (choose one) drop-down in the "QuickBooks Online" column. Choose the pay type that closely matches how the item was set up in your Desktop file. To make sure the pay types match, it's a good practice to check your QuickBooks Desktop file and see how your items are set up. Example: Match 'S Corp' to 'S Corp Insurance' pay type. After completing the mapping, select Save and close. Perform the same process for each item that needs to be mapped, then select Continue. Note: You cannot go back and map your pay types if you select Skip for Now. Don’t see options to choose from? Some pay types imported are not supported in QuickBooks Online Payroll. If this is the case, select Skip for now in the bottom right of the screen. Note: After selecting "Skip for now," you'll have to manually create pay types for your employees to complete the payroll setup. QuickBooks Merchant Services are currently not supported in QuickBooks Online. You can either e-invoice your customers with PayPal or GoCardless, or find a suitable app. Once imported to QuickBooks Online, the calculation method for your stock will be FIFO (first-in-first-out), using the "as of" date that you chose during import. What does this mean for my business? You'll need to file form 3115 with the IRS to notify them that you made this change in accounting, using the "as of/effective" date that you chose while importing. Learn about this form and stock in QuickBooks.